Turn your BlackBerry into a virtual stock broker with these amazing apps for Stocks and Investments!! Not too long ago, we’ve covered some of the best BlackBerry applications that are designed to help you manage your bank accounts. You can find them in the CrackBerry Guide to banking on your BlackBerry. Obviously, we know that your financial concerns don’t stop there-your money can also be found in stocks and investments. In recent years, especially with the economic crisis, it hasn’t been the best of times (for some). With that said, anyone who does dabble in the stock market and such could, and should, use any tool at their fingertips. Luckily, this so happens to be the CrackBerry Guide to BlackBerry Stock and Investment apps. What we have here is a collection of some powerful applications that will help out anyone- from stockbrokers, to the person who only wonders about stocks and investments. If you have these types of applications on your BlackBerry, you will truly have a portable portfolio with which you can really keep a tight grip on. Without further adieu, let’s check out what applications are up to the challenge. With investors in mind, the application is designed to help you generate profit. StockStream Mobile offers access to the latest company and market news; with views like headline news and news by symbol. To help you keep on your toes, you can set up alerts for specific stock movement, price, bid and % change as well. 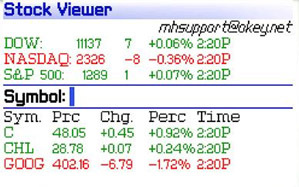 Real time updates are displayed using information that includes EPS and PE Ratio. 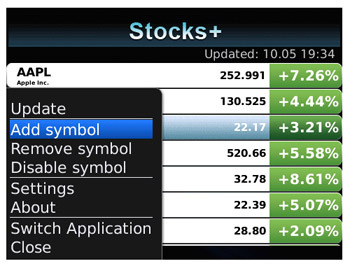 StockStream also offers to let you view trends in stocks with detailed charts or manage stock watchlists. The StockStream Mobile is available in various packages, starting at $9.95/month. This is geared towards companies who want to offer their customers this type of application. With a very intuitive UI, this application acts as a stock swiss army knife. In depth information regarding mutual funds and stocks are easily captured. E-Mobile Stocks also gives you access to your portfolio, so you can obtain an understanding of how your stocks are performing. As with StockStream, e-Mobile Stocks also provides stock alerts, detailed charts and the latest news. E-Mobile Stocks is available for $19.95. 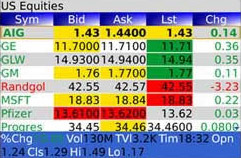 Stock Viewer is a simple application that will enable users to retrieve real time stock quotes, as well as save their favourites/stocks of interest. It’s incredibly lightweight, with regards to file size and power consumption. Stock Viewer is free. If you wished that you could quickly check out your stocks from your home screen, then StockIcons may be right up your alley. This application will display your stock watch list on the home screen; using customizable colours and fonts to help differentiate each stock. 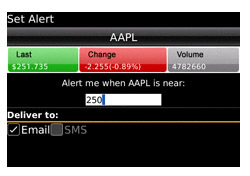 You can also allow StockIcons to alert you, via vibration, if a specific stock reaches a particular price. StockIcons is available for $3.99. If you’re like me, you probably find the stock market to be a bit overwhelming. I don’t even know where to start- I just stare at symbols and numbers in wonder. Stock Pick of the Day promises to provide assistance. The developers make use of Brilliant Warrior Investments to pick the stocks that will be presented to you. They cover different strategies such as; Long Term, Short Term, Dividend and Earnings. 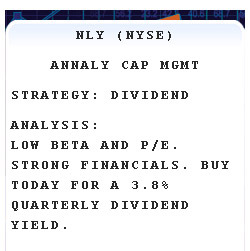 Stock Pick of the Day is available for $3.95. E*Trade Mobile not only brings you the stock and investment data you crave, but also lets you implement your decisions. This means that you can buy, sell, and place orders right from your BlackBerry or even transfer funds between accounts. Detailed, real time quotes are brought to you quickly and can be easily picked through. You can also keep an eye on what is heating up the NYSE and NASDAQ, with commentary and breaking news. 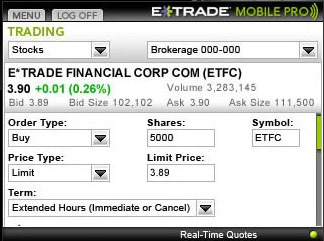 E*Trade Mobile Pro is free to E*Trade customers. Besides being a fun word to yell, Yahoo! offers quite a bit when it comes to financial data. With the Y! Finance mobile app, you see detailed information on market conditions, competitors and other stats. In addition to tracking specific stocks, you can check out commodities and industries, review currencies and analyze graphs. 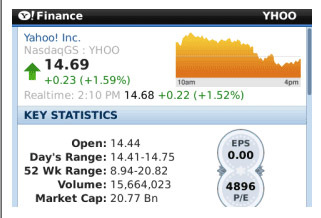 Maybe the next time you say yahoo will be as you are checking out your stocks. Y! Finance is free. TheStreet is one of the best sources for stock market analysis and news. This application pushes the latest information directly into your hands and even provides home screen notification of new items. Besides viewing market data, managing your portfolio and reading news stories, you can also check in on Jim Cramer and his stock picks, as well as see RealMoney updates. If there is any information you deem worth sharing, you can send it out through Twitter, Delicious or email directly from the app. 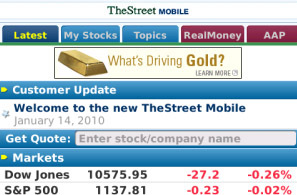 TheStreet Mobile is free to account holders. With a name like that, it sounds like it should be on another platform. 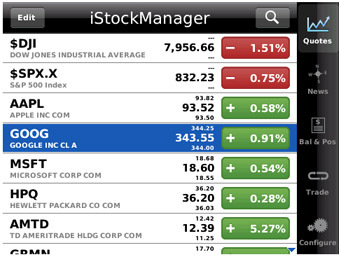 Nevertheless, iStockManager is a great application to have if you have a TD Ameritrade account. It can be used without an account, but users will have less access to its features. You’ll be able to trade options and stocks, check out live balances and positions, as well as view your account information.M iStockManager is free. Currently in Beta, Stocks + is already proving to be an incredibly useful application. Your home screen is transformed into an automatically updated list of your stocks, giving you quick details at a glance. Stocks + makes it easy to manage these stocks (and look up new ones), as your interests change over time. As it is in beta, Stocks + is currently free. We hope you enjoyed the collection of third party stocks and investments apps. With this on your BlackBerry, you stand a much better chance of profiting. Just remember who told you about them ok? ;) Your BlackBerry isn’t powerless when it comes to stocks either. Your home screen sports a Stocks icon, which redirects you to Reuters Quotes. Just type in the symbol or company and voila! You can also have alerts sent to your email or even hit your browser. So now, your BlackBerry is a money maker AND a money manager! If there any applications we need to “stock” up on, let us know!